I always loved the gardens of Divinity's Reach (Guild wars 2). It has some roman influences which I really like. A month and 13 days has passed, can we have an update on this one, Yeti? I'm slowly beginning to work on this again, after being pulled away from modding by other work. Mostly, I've been adding rocks around the coast today. Nothing really worth uploading yet, but I'll post a file soon. I'm in favor of removing the wall, but see if you can make it work first. If removing the walls causes too many complications, it might be best to leave them as is. Looking at the wall again, I'm a bit skeptical about the proposed removal. I'm not sure it would provide us with a large enough improvement to warrant the trouble. Here's a new file. The island with the lighthouse is coming along nicely, I'd say. When do we expect the PC_Ex_Anv_plat_01 pieces to be replaced in data? I'm curious to see what their replacements will look like. Yeti, based on your latest file I see that there are two unfinished small Imperial forts just outside of Anvil. If you can finish them, then I'm able to unlock those interior claims and finish the overall setup for the interior claims outside the Anvil city walls. The plat pieces aren't getting their own replacement, they should be removed (almost) entirely and replaced with the new Stirk/GC docks tileset, which is already in data. Idea: could you replace the Imperial Navy building with a building made of Imperial fort pieces? I would echo the castle on the other side of the bay, give the place more visual unity. Also, it would make sense that Legion affairs only happen in Legion buildings, like the Temple in Morrowind. Hey guys. Sorry I haven't been around. I hope to have another update soon. Probably nothing major, but it will be something. Your proposal for the Navy building sounds interesting, Infragris. I'll see what I can do. As for the nearby forts Leon mentioned, I imagine I'm correct to assume one is meant to be ruined and the other is active? Could you remove one of these forts and replace it with the Old Imperial Ruin tileset? Currently, we have no ruins of this type anywhere in the release area, because the set was not yet finished during exterior work. Since these forts are unfinished, we don't lose a lot of work on them. The lighthouse at -51, -124 uses the Seyda Neen lighthouse model. I think this looks rather out of place: this building should remain unique to Seyda Neen, or at least only be used in derelict environments. The data merge should give you access to all kinds of new building meshes from TR, which can be used to make an Imperial-style lighthouse (flag them here if they are not using the Gold Coast Imperial textures, and we'll convert them). Don't forget to implement the Stirk dock set along the Anvil waterfront, to get rid of those square blocks. The Imperial Highway from Anvil to Brina Cross (indicated in yellow on the map) should be furnished (and textured?) with the Highway tileset that worsas made. Make sure to use the appropriate Gold Road milestones (they are color-coded). These unique road pieces are needed for the player to orient themselves in our rather large landscape. I think we should remove the large "warship" models entirely, and replace them with the smaller galleons. It will make the harbor look busier and larger if there are six ships anchored instead of three. Also, we won't have to spend a lot of time and effort updating these atrocious models, which cannot be used anywhere else on the map. You mean the Stirk dock set? By the way, I really like that tide pool area north of Anvil. Never really noticed it before, but it looks really nice. EDIT: one last thing I forgot to mention: could you add one some apple tree orchards around the farms near Anvil? I did some work on the Navy HQ. 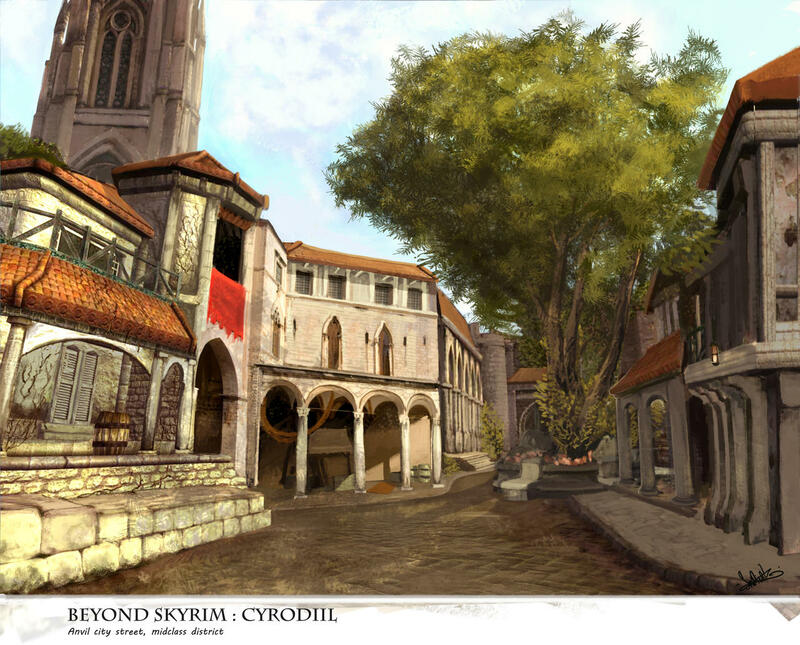 I'll replace the original fort pieces with the Cyrodiil ones for the next update. What are the IDs for the new docks in Tamriel Data? I found the T_Imp_SetGC_X_DocksTown ones, but I don't see how they could be used to replace the current ones adequately without major reworking. I'll make sure to follow your directions on the forts, Infragris. What are the IDs for the Old Imperial Ruin tileset? 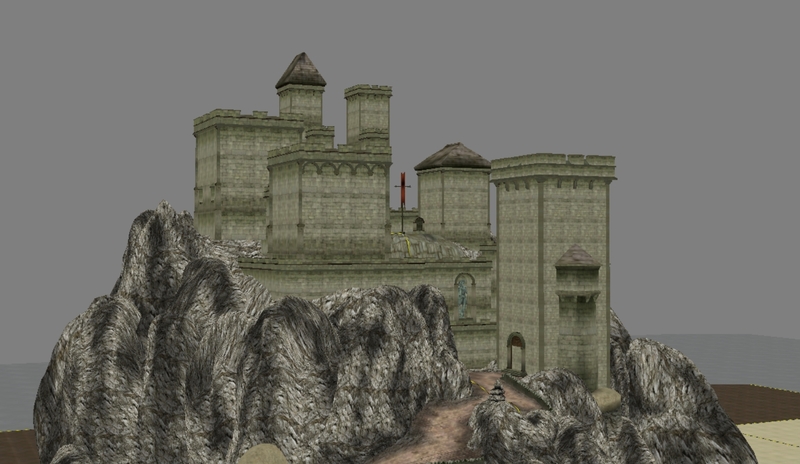 Yeti wrote: I'll replace the original fort pieces with the Cyrodiil ones for the next update. Nah, I can do that for you once this claim is finished, replacing the vanilla tile-sets is not high priority at this moment so don't waste your precious time doing that! The Imperial ruins tileset is "T_Imp_DngRuinCyr_X_"
Well, I'll see what I can do! And I appreciate for the offer, Leon. I wasn't certainly looking forward to that step of the process. I know it's been a while, but here's my most recent work on the city. I've started replacing the docks, and I'm still not sure what to think of them. Is there a reason why they're colored pink/purple? Being made of wood obviously means we can't place Anvil's stone buildings and walls on them, so if we replace the majority of the white stone blocks, we'd have to undo many of the city's nicer features, such as the secondary harbor. After some experimentation, I still don't know how to use the Imperial Ruin tileset effectively. Is there an example of how these pieces are supposed to fit together that I can look to for inspiration? I have just looked at this claim in the CS and I must say, I can definitely feel your pain. Imo, it is not a good idea to reproduce those giant docks with the new dock pieces. One of these large docks is probably great as a main docking area for the imperial navy, but other than that you should probably create many narrow docks with them that look better, when created the stirk dock set. I don't know what the others think, but to me it seems like it was better to keep the platform pieces in the areas of the city where they haven't been exchanged yet and just put some effort into making the new dock pieces work where they have been already exchanged. As said, I think it would be better to make smaller docks with them and maybe only keep the massive dock next to the imperial navy quarter as it currently is and one of the two massive docks (maybe the one next to Bendu Olos statue) for the galleons. But this is just what I see as a possible course of action right now. Thankyou for trying to make it all work. On the imperial ruins. If you want to make a ruin tower, you need to put T_Imp_DngRuinCyr_X_Basement - pieces at the bottom, T_Imp_DngRuinCyr_X_Middle - pieces on top of them and on top of those again T_Imp_DngRuinCyr_X_Top - pieces. There is obviously a lot of versability with these pieces. It's also possible just to use the rectangle tower and wall pieces and combine them in whatever fashion, you like. Usually you don't stack wall pieces into the circular tower. They are used to surround this tower structure, but they are totally optional, too. The main reason why the harbor needed to be reworked was that it was too undetailed. The use of those large blocks makes it look like it's made out of lego or something. It would be best to use the corners and dead ends to make the harbor look more dynamic and less monolithic, with differences in height, smaller canals, etc. If there is a need, I can make more pieces: just tell me what you need. To be honest, I thought the use of the buildings standing halfway on the docks was a bit weird before. As it is now, it doesn't really disturb me that much: they're not stone buildings built on top of wooden docks, they're wooden docks built around stone houses. The color was originally designed for Stirk, it does look a little out of place. Perhaps we should retex the dock set with Anvil textures after all? Or maybe just tweak the docks textures to be useable everywhere, I don't know. For a set of maybe ten pieces, the data bloat is negligible. Looking at it from a distance, it does feel like we're mixing too many different styles and textures. One other thing we could do is turn the platform block into its own simple tileset: I they could be linked together seamlessly, the lego effect might be diminished. On second thought, that's what I propose: we redo the docks tileset in the same textures as the Anvil platform block. Maybe try out if they fit in Stirk: if so, we do a clean retex, if not, we just make a second set. We link this to another tileable set based on the platform piece, which can be used to make a "clean" harbor, with the docks set used to detail it. How does that sound? At the moment, I'm not sure, if it's a good idea to keep Yeti tasked with all these fidelities. There are quite a few things that we need to change about the city and its difficult to manage it all through this thread here. This is not meant as criticism to Yeti, though. The current time pressure makes it difficult to handle all these different problems well. We could freeze the Anvil parts of the claim for now. Consider this map: all the grey marked cells are part of this claim. Put aside Anvil for the moment, and there's still plenty of seafloor cells, higway set, and detailing to do in the rest, for which all essential assets are ready. As a bonus, interior claims for these cells could be unlocked ahead of time. I'm fine with stepping away from Anvil for now. For the ruins, I understand you put the bottom pieces on the bottom, the middle in the middle, ect... but when I tried that out, they didn't seem to fit together. And are there stairs for going between one level and the other? In the Skyrim_RestExteriors.esp, there are a couple of examples with the sibling DngRuinSky - set that you could look up to get an idea of the usage. Here are proposed retexes of the current anvil-walls, using legion fortress textures to reduce the clash with fortresses in and around the city and the highway additions that are yet to come. Something the city is currently lacking is some additional stress on the native armory. I wonder, whether it wouldn't be a good idea to add one or two more armorers to the area around the central marketplace. Instead of using the skaal furnace, a more fitting Anvil could be created using T_Imp_LegionCyr_I_PitJamb_01. Or we should maybe create a dedicated Anvil model like the Skyrim-one? Well... after what happened yesterday (I imagine you can guess what I'm referring to) I'm not sure I have the energy to make meaningful progress on this claim. It would be better for both our sister projects if I stepped away from this and narrowed my attention on other areas, namely SHotN's planned Christmas release. To be honest, I've been spreading myself far to thin lately, taking on more tasks than I could reasonably juggle. I don't want my words to sound empty when I say I'm going to do something. In that regard, giving this up was a long time coming. Your walls look good, worsas. They blend in better with the fort structures. I am sad to hear this, but I also fully understand. These are bad times for many, and your personal situation and comfort should be your first priority. Thank you for all the work you've put in the project. I fully agree on using the Legion textures: it makes a lot of sense seeing the town's history, and it helps a lot to give the town more visual coherence. As a bonus, Imperial fort assets could be used to give the walls some more details, and the wall assets could be used to give the castle some more identity. There are a couple of good forge and smelter meshes in the Ald Krieg resource: these should only need a bit of texture tweaking to be useful. 2 - The St. Naharine Circle: formerly the Knights of the Lily HQ, but knights are out. Country club in reverence to Saint Naharine, a Colovian Founder Saint. Check the lore articles about Saints and Saintly Circles for more information. Very exclusive, but you might be able to get something to eat here. 8 - The St. Amiel Maritime Circle: formerly the boating club, I'd like to profile this as a fancy gentleman's club founded by officers from the West Navy. Saint Amiel refers to Amiel Richton, the villain from TES: Redguard. 20 - The House of Dibella: aka the sacred brothel. These are positioned opposite from the temple, maybe connected through an underground passage. You should be able to buy food and drink in the city's brothels. 21 - The Count's Arms: classy tavern and inn. Rentable bed. 22 - The Abecette: Anvil's famous gambling palace. Suites in the palace should be for rent, but maybe only to friends of the house. Lots of drinks and food for sale here. Gambling games in the Abecette could be set up through dialogue challenges depending on the player's luck/sneak/security/personality stats. The Abecette should feature "inner halls" on invitation only, with extra entertainment like a fight pit. 25 - Thieves Guild Hideout: taverns as Thieves Guild hideouts are traditional, though I would like to propose making this one a moneylender. Check the [Faction] Thieves Guild document in planning for details. 33 - Poor Brothel: arguably a bit big for a poor brothel. I think we could just remove this building without really affecting the scene much. Open up the harbor, maybe put some cranes and dockworker equipment there. 66 - The Rusty Cutlass: poor tavern. Thieves Guild or pirate related? Could be a gambling hall: maybe a rat fight pit in the basement, where player can bet on the rat fights. 83 - The Flowing Bowl: poor inn. Rentable bed. 84 - The Fo'cs'le: poor brothel, frequented by sailors and Navy soldiers. Rentable bed? Would you mind if I take hold of the esp for a day or so? I don't think I'll claim it, but there are a couple of things I'd like to try. Not at all. It's probably easier to implement your ideas by your own hand. Sounds good. There are already plenty of buildings with similar purpose around, it seems. I thought there weren't enough classical inns, but since the brothels seem to offer bed and food, too, it's probably fine already. I wonder, if the graveyard next to the navy-headquarter isn't maybe at a misfitting location. Couldn't it be moved to the green area in the southeast of the city or to an area outside of town? The space next to the navy headquarter could be saved for something with relation to the navy. A small shipyard or a foundry or a temporary quarter for legionaries that arrive or wait to take off? Just something that makes the area around the navy headquarter look and feel busier and more relevant. Well... after what happened yesterday (I imagine you can guess what I'm referring to) I'm not sure I have the energy to make meaningful progress on this claim. I can understand the current frustration. It's probably better like that while we are shuffling things around now. The green area southeast is the temple gardens: we could put some headstones there, but I don't think it would fit as a dedicated graveyard. Putting it outside the city sounds best: historically IRL graveyard were often built outside of cities due to various superstitions. Matches the Stirk graveyard, too. Here is a small preview of some tweaks I'm doing to the anvil houses. The three-story house has gotten an alternate roof to add a bit of much-needed variety and contrast. http://i.imgur.com/dH6eFCM.jpg The West Navy Docks now occupy the area of the old HQ and the graveyard, which will be replaced outside of the city limits. The docks will be completely in Legion style to distinguish them from the rest of the city. The double walls should delineate this part of the city from the rest and prevent style clashing. http://i.imgur.com/QsswTTX.jpg Castle Umbranox in native Legion style. 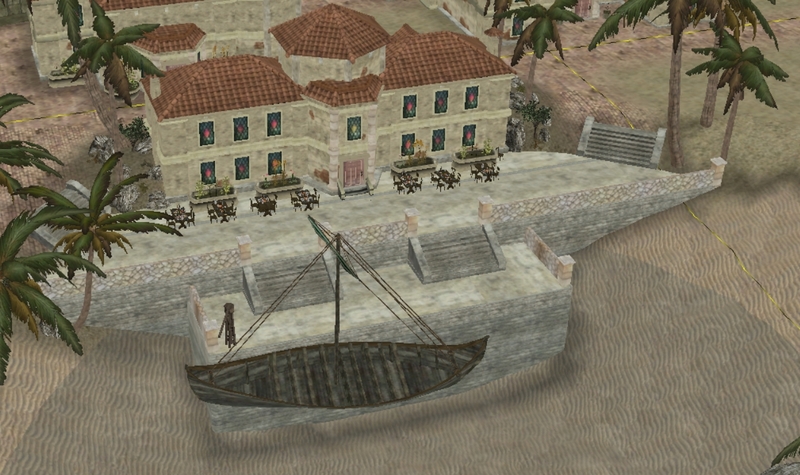 http://i.imgur.com/FsyyFGt.jpg The rich boating club, using the continuous Anvil platform pieces as docks. Looks a lot cleaner imho. http://i.imgur.com/7UkKwKC.jpg The Sailor's Quarter canal. 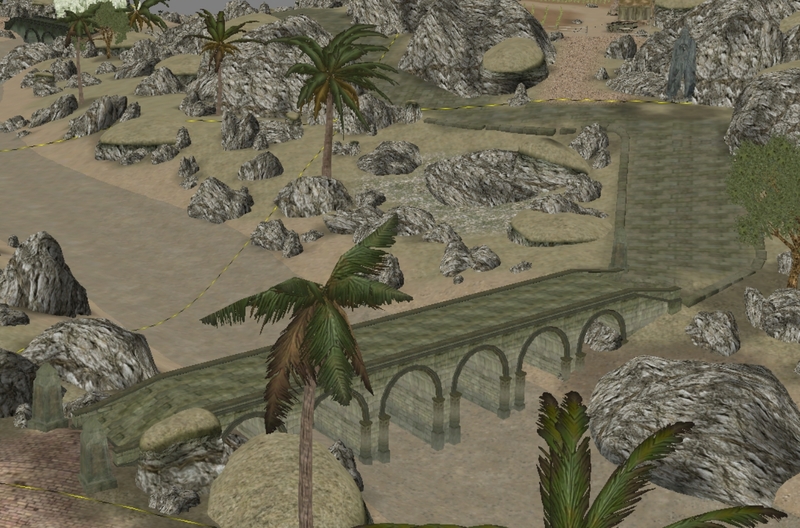 Top part of the canal has been replaced using the new pieces, lower part still uses the old blocky platforms. 2. Redo the wall meshes to look more like Imperial fortress meshes. My preference goes out to this one, as these kind of massive walls could be useful for later Legion fortifications, dams, infrastructure etc. I've made a rough proof of concept visible below. Only problem with this is that the back of the walls is relatively undetailed, but it is imho not worse than most Tribunal meshes and easily obscured by the city itself. This way, the walls still draw a lot of attention when viewed from outside the city, but no longer look out of place from within. Also, it has a lot less polys. Whatever we decide, the models need to be changed in one important way: they need to be lengthened at the bottom so that they actually sink into the ground, not hover on top of it. 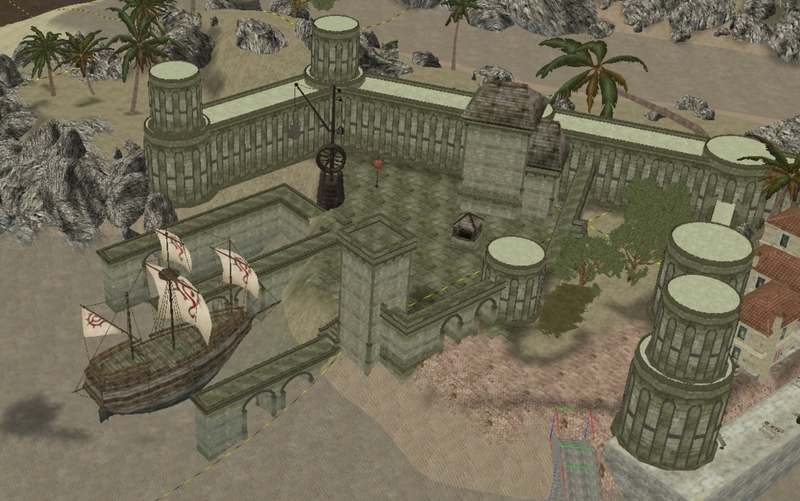 Another mesh I'm having trouble with is the Dibellan temple. The current model is too close to a basilica/christian church, especially with the extra tower on the back. I'm not quite sure what to do with it yet, but at the very least I would like to remove the circling steps.